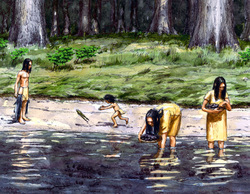 Early Native Americans harvesting mussels for food and other uses. 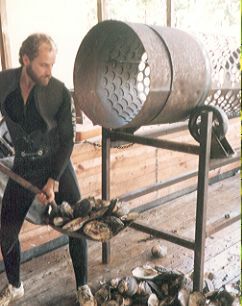 This page will explore the history of mussel harvest and uses along the Tennessee River Valley. It is broken down into sub-pages to make navigation easier. The picture here shows a diver running his shells through a 'shaker'. These tubes have holes cut into them and are rotated by an electric motor. As the shells travel through the shaker, smaller ones fall out onto the ground. Shakers are also used to separate the meat from cooked shells. 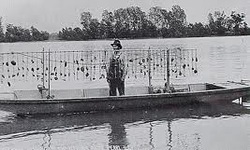 Here is a brief history of brailing, an old method of mussel harvest that is still in use.